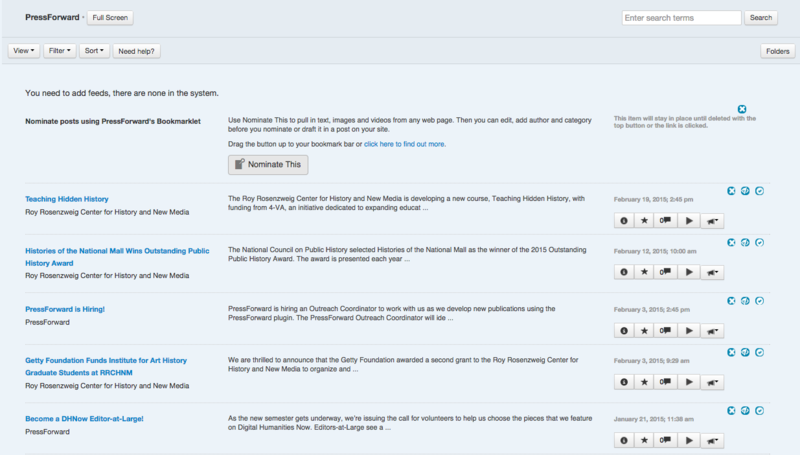 The All Content panel is populated with items from the feeds you have added to the reader. (Items from the Nominate This bookmarklet can be found in Nominated.) In both the All Content and Nominated panels users have the option of viewing items in several ways, outlined below. Users may also browse in Full Screen mode by selecting that option on the top of the page. 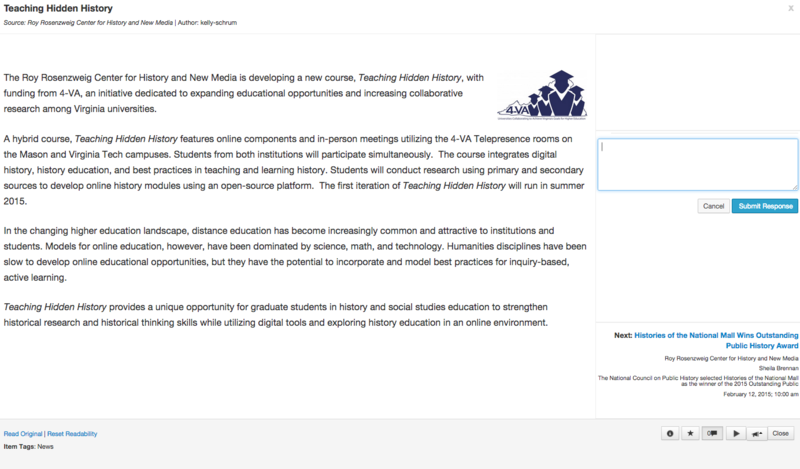 Select the All Content tab from the PressForward menu. From All Content, you can browse items by seeing the title, the first 75 characters of each post, and the name of the source feed. The options in the All Content navigation bar allows users to sort and filter items, filter by folder, view items in infinite scroll or grid view, and get help using the plugin. As users scroll through content, the navigation bar will stick at the top of the window. You can also switch to a List layout. 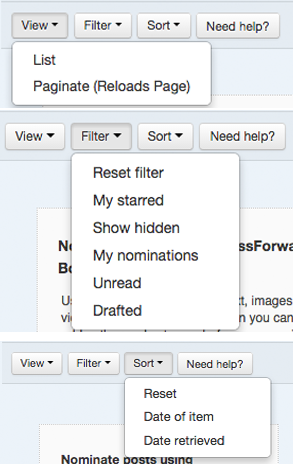 In the Filter dropdown menu, you can filter All Content by starred, hidden, nominated (by you), unread, or drafted items. Filtering items using this dropdown menu will reload All Content. Choosing to reset the filter will show all items. The Sort dropdown menu allows you to sort items by the date they were retrieved by the plugin&apos;s feed reader and by the date they were published. Sorting items does not reload All Content. Sorting and filtering choices can be traced using the breadcrumb trail at the top of the page. Below the navigation bar, you will see feed items in either list or grid view. Each item contains the item title, the source feed, a snippet view of the item text, the date the item was retrieved by the plugin, and an item toolbar. The toolbar that appears with each individual post enables you to interact with each item and to select particular items for publication. Select the Nominate button (single arrow icon) to nominate the item for editorial review. Nominated items will appear in the Nominated panel. Click on the bullhorn icon to see the Amplify options. If you are logged into WordPress with administrator permissions, you can use this button to send an item directly to WordPress Posts as a draft. If you are not, you can use this button to tweet the selected feed item. Each item also has three option buttons associated with it. The X option deletes the item, the checkmark marks the item as read or unread, and the eyeball hides the item. These options are user-specific. Deleting an item does not delete it from other users&apos; All Content panels. In All Content, clicking on the title of a feed item will open the Reader View. This window allows you to view the feed item title, author, and source feed, as well as the complete text and associated images. In the top right corner, you can find information on and a link to the previous item in All Content. In the bottom right corner, you can choose to move to the next item. Using the toolbar in the bottom right, you can get information about the item, star it, nominate it, or use the amplify button to send the item to draft or tweet.